When the Martians hit Earth, they hit it hard. Fighting now rages all across the globe and the tales of devastation and despair are many. 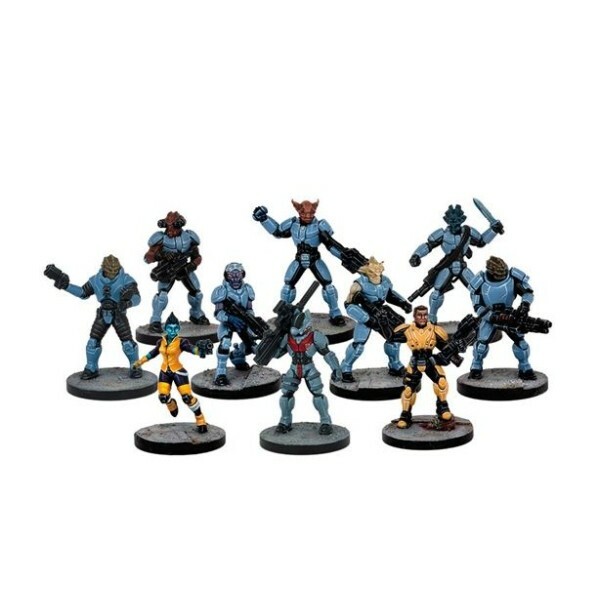 While the world’s governments stood idly by, a secret organisation called the Novas Vira was preparing to defend Earth from the Martians. 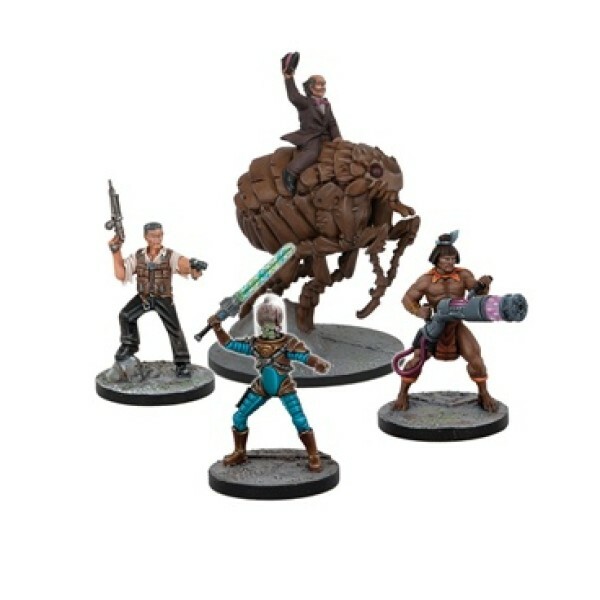 In hidden locations deep beneath the planet’s surface, they built a secure communications grid using reverse-engineered Martian technology supplied by a mysterious benefactor. The Martians that planned the Invasion never knew about this hidden network, but now, as their Saucers surround Earth, a Martian General named Tor has learnt of its existence. Tor knows about the Novas Vira, and plans to use this information to find their leader’s hiding place and become one of the greatest heroes of the Invasion of Earth. His first clue is the relay station he discovered… right in the centre of Greenville. 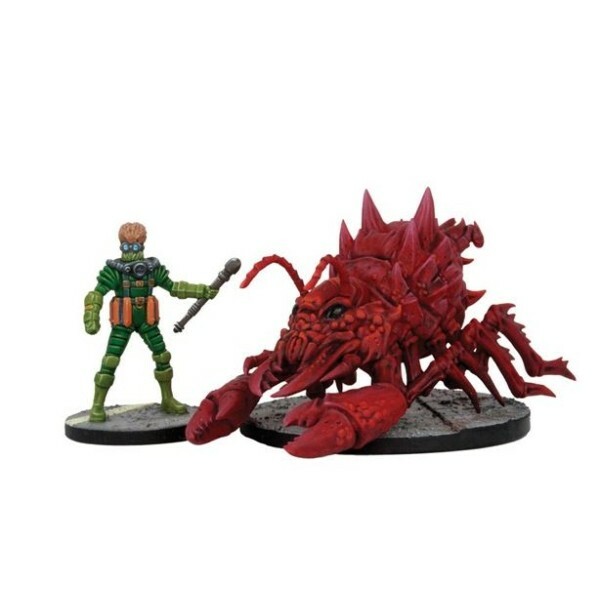 Now, the invasion has begun. 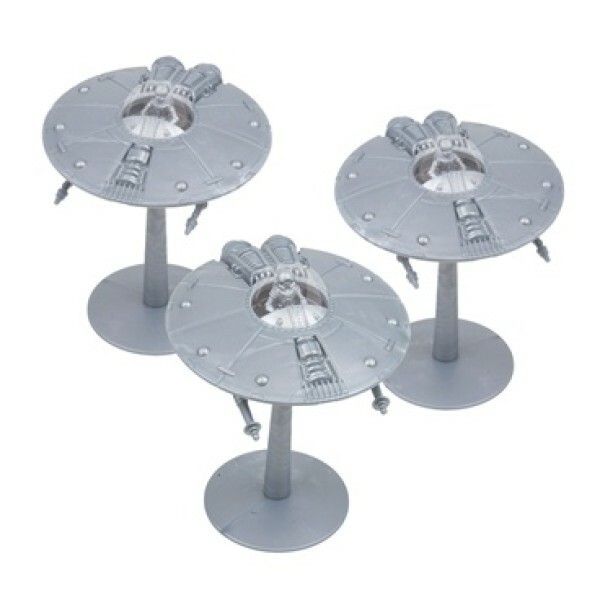 Saucers have landed and the death rays have started firing. It’s time to pick your side and prepare for battle! 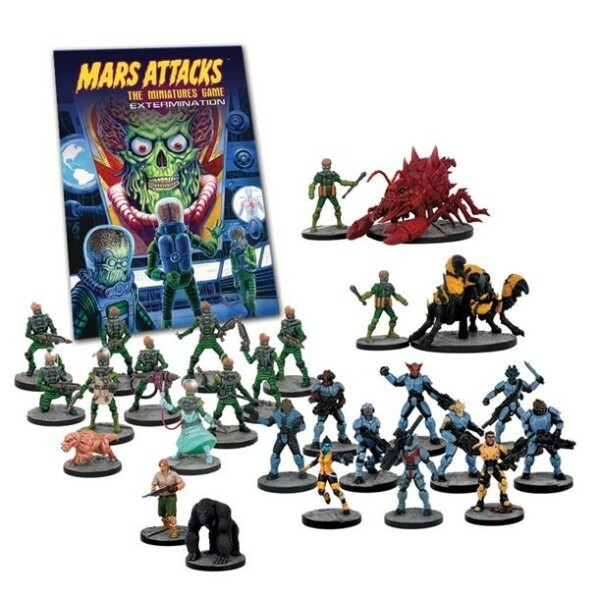 Mars Attacks – The Miniatures Game is the crazy tabletop game of Martian Mayhem, played with miniatures ready to game with right out of the box. 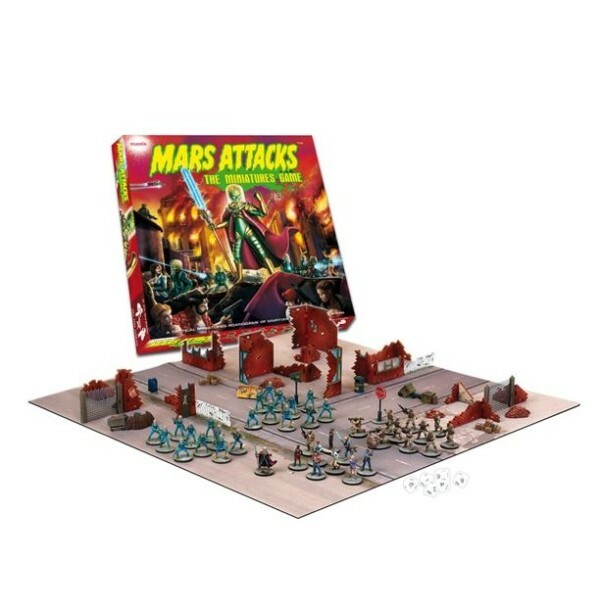 With Mars Attacks – The Miniatures Game, one player controls the might of the Martian Empire’s vast army of invaders and the other the brave defenders of Earth, battling against impossible odds. 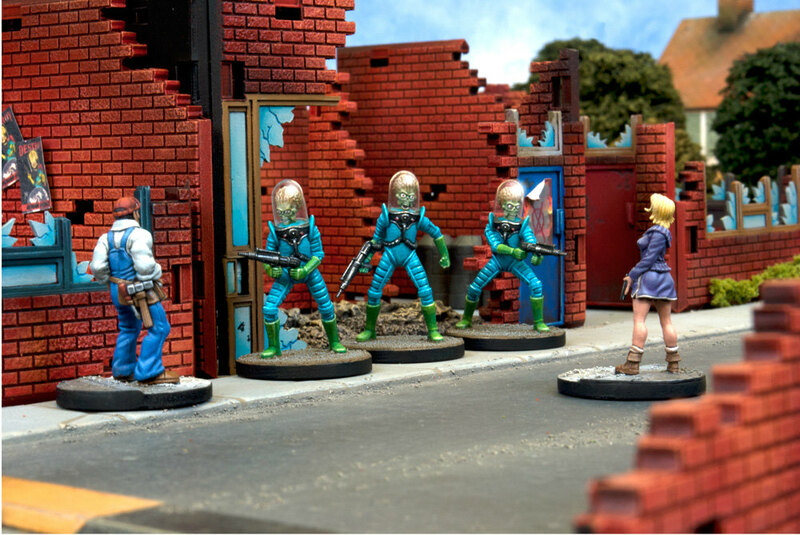 You will guide your forces through a number of playable scenarios and the devastated ruins of Greenville using our simple and wacky rules set, culminating in a fierce battle to capture the Novas Vira Communications Center. Will you persevere with your human forces in a desperate bid to push back the Martians, or will you guide General Tor to his ultimate objective and uncover the leader of the Novas Vira? Only you will decide the fate of the planet! 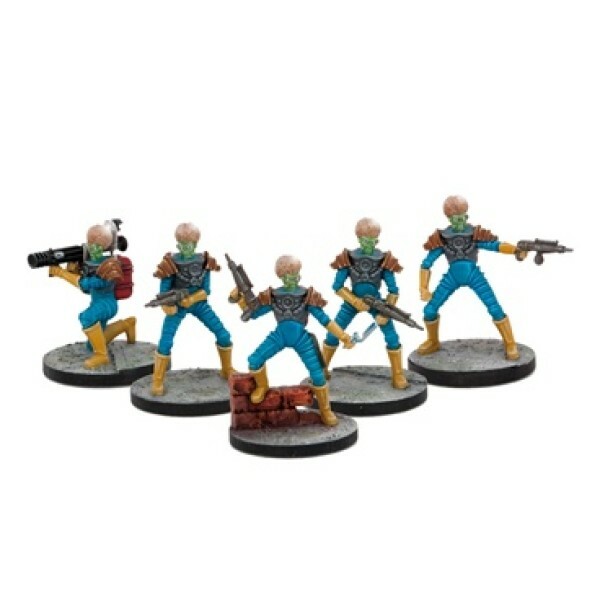 They came from another planet and now they want ours! Hundreds of alien soldiers run rampage as t.. The first wave of the invasion is over, and General Tor is determined to wipe all resistance from.. 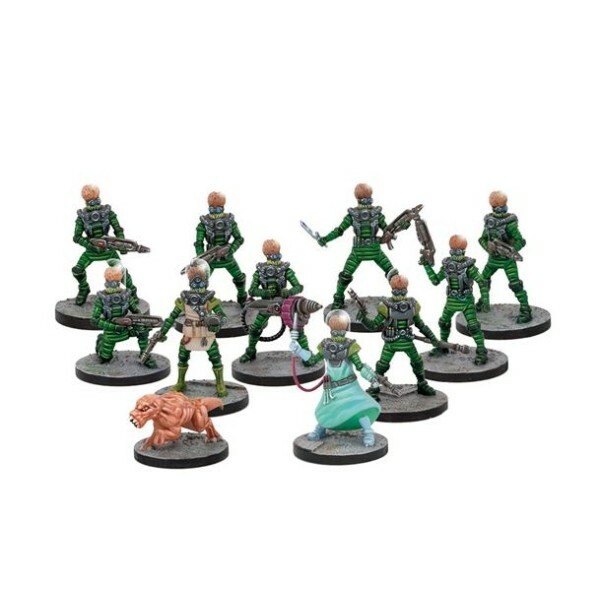 Number of Miniatures: 27 figures Product Type: Expansion Just when it seemed like things ..
All Martians are trained and prepared for war from an early age – theirs is a society dominated b.. 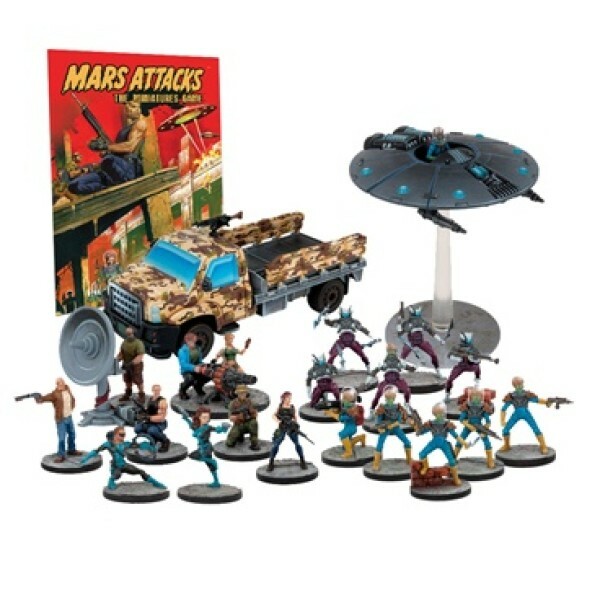 The heroes of IDW’s Mars Attacks comic arrive on your tabletop to make your games even more epic!.. The US Army has been protecting its people from threats domestic and foreign for over 150 years. .. 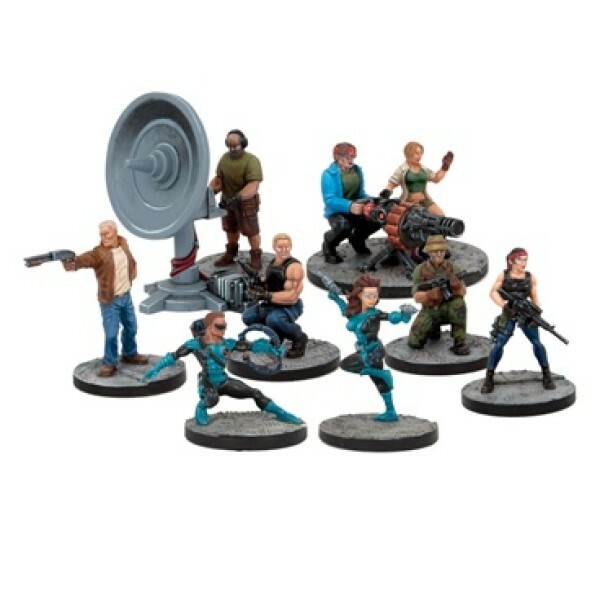 Number of Miniatures: 11 Product Type: Martian Booster When sheer brute force fails, send.. 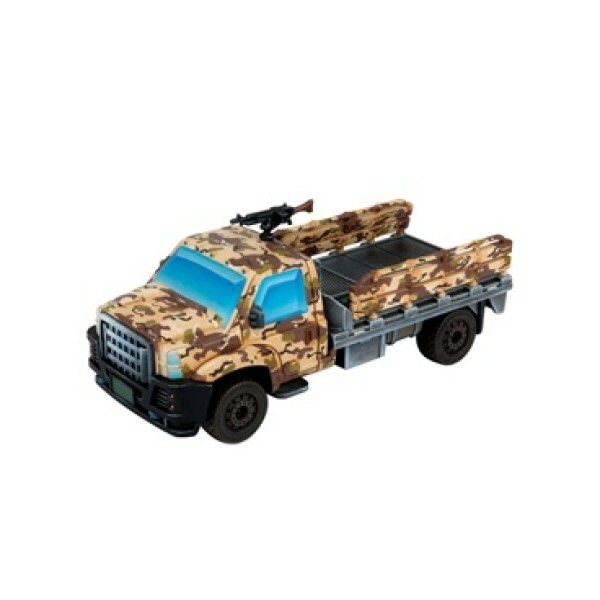 Number of Miniatures: 10 Product Type: Human Booster When the Novas Vira need a job done,.. 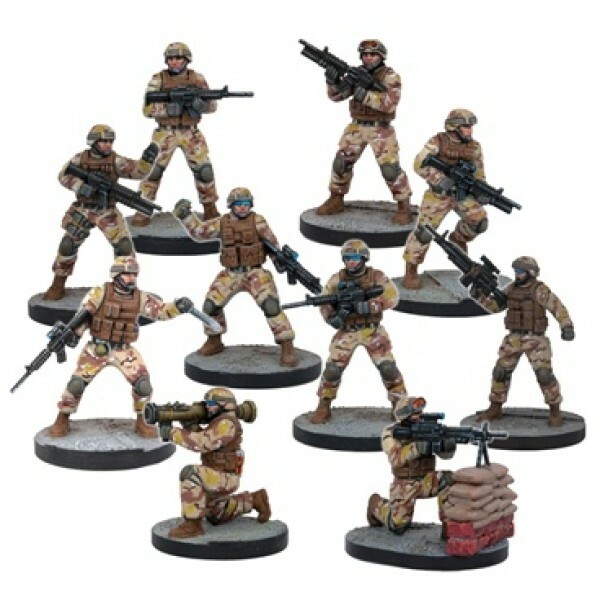 Going against every tradition in Martian military doctrine, these specialist troopers sneak about..
Operating in small groups ahead of the main invasion force, Marines are often able to complete th.. 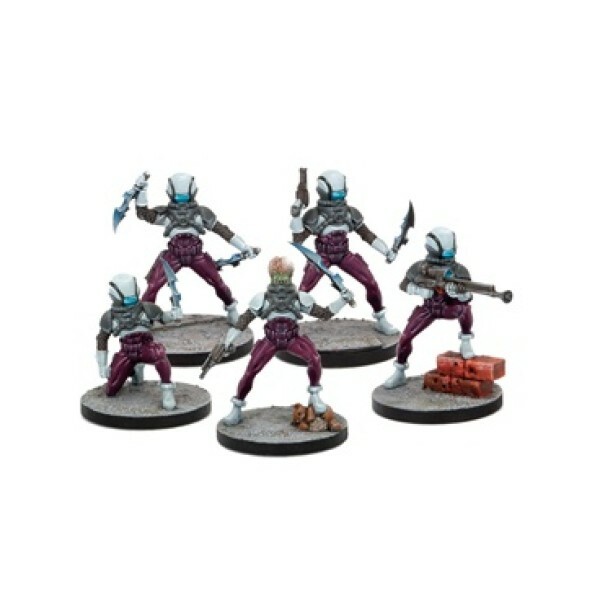 The Novas Vira are the only forces on Earth who were prepared for the Martian invasion, and as th.. 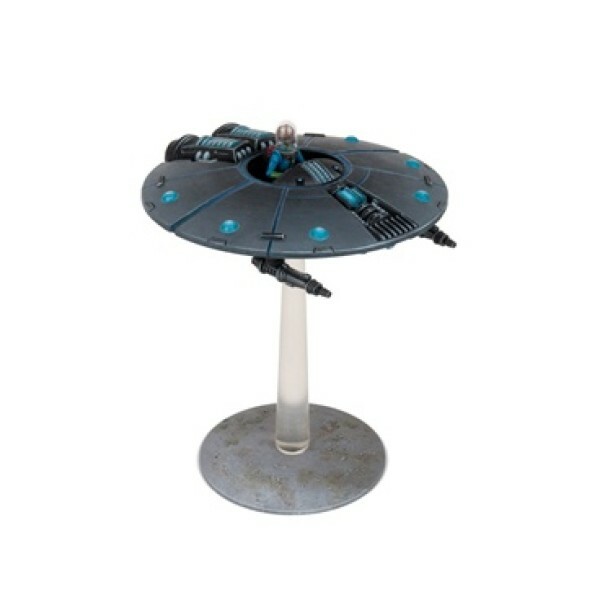 Swooping in to exterminate the ground forces of humanity, the Attack Saucer relies on sheer speed..
With the majority of their vehicles destroyed or rendered useless by the invaders, the armed forc.. 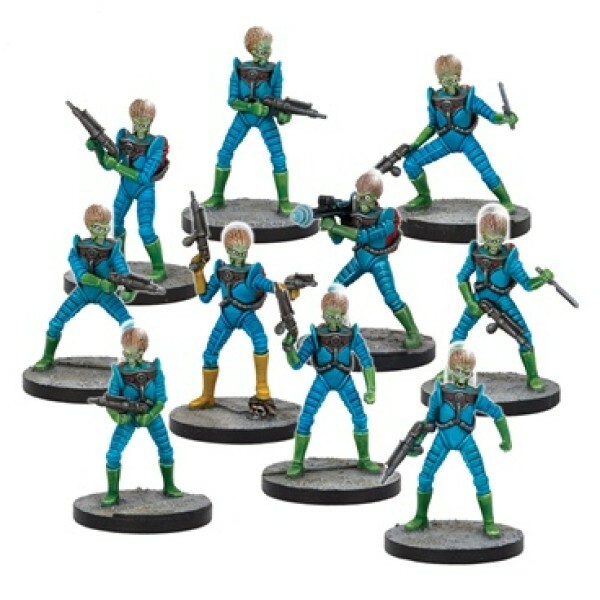 Number of Miniatures: 2 Product Type: Martian Booster When the Martians invade a planet, ..